"Don’t worry, Anna. I’ll tell her, okay? Just let me think about the best way to do it.""Okay. ""Promise me? Promise you won’t say anything? ""Don’t worry.” I laughed. “It’s our secret, right?" Do you believe that some books are meant to be read at a certain time in your life? You stare at it on your shelf for months or in this case, years and know that you need to read it but just never pick it up until one moment, you do; and all of a sudden all that waiting makes sense. All that time that went by was exactly how it should have been because these characters were meant for this part of your life. I can't be alone with this, can I? 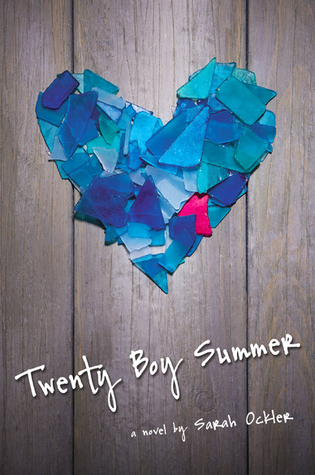 I truly believe some books are meant to be read at a certain part of your life, and that is how Twenty Boy Summer was for me. Yes, I may be 10 years older than the main characters in this novel but that doesn't mean that I didn't relate to the strong bond of a friendship, the heartbreak and the discovery of who you're meant to be. As blurbed on the cover by Jo Knowels, this book will break your heart and piece it back together again, just like the sea glass pictured on the front. That statement holds so true! I devoured this novel in just 2 days(if not for real life getting in the way, it would have been just one sitting). I simply couldn't let this book go. I got completely immersed by Frankie and Anna and their story's. Both are left raw and empty at the death of Matt, Frankie's older brother and Anna's first love, only one thing is weighing heavy on Anna, Frankie had no idea her brother and best friend were seeing each other before his untimely death. Anna is left having to be the strong one for Frankie and her family when she, too misses Matt in a soul-crushing way. Although Matt's physical presence is brief, his spiritual presence is strong and consistent throughout the entire novel. That is not an easy writing feat: To take a main character and introduce him only to quickly remove him, but have his presence still remain a strong part of the novel, not easy! I could easily see what Anna fell in love with Matt. He was kind, funny, passionate and had a beautiful way with words. He was an intellectual and wise beyond his years. Your heart will remain wide open in this book until you complete the last sentence. I'm struggling with this review because I just want to really get into every single thing I loved about this novel. Frankie and Anna's hilarious and at times painfully raw moments. Red and Jayne, Sam and Jake...I am totally team Sam by the way! Everything about this novel was an epic win! I am so glad I finally plucked it off my shelf and read it, now I urge you to do the same...that's if you haven't already, if you have then give it re-read and visit this amazing story and beautiful characters. A heartbreakingly beautiful story of 2 best friends trying to move forward after a tragedy and in the process discovering themselves. I'm glad to see you enjoyed this one! I've wanted to check it out for the longest time because I've heard such great things. AudioHaNoi.Com chuyen cung cap Loa hát Karaoke Gia Dinh giá tot nhat HN.